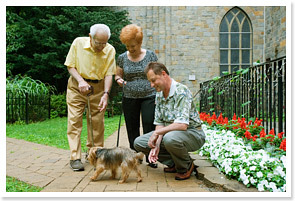 Methodist Home volunteers bring their love and dedication to the Home in everything they do. They work directly with residents, or assist professional staff, to achieve the Home’s mission of providing the best possible care and quality of life. Volunteers can do many things at the Methodist Home, from leading Bingo games twice a week to transporting residents to Chapel every Sunday, and more. College and high school students seeking practical experience (or for certain internships), as well as retirees and other individuals looking to help or develop new skills. Since 1970, the Auxiliary has been a dedicated group of individuals who help residents and raise funds for the Home’s wide range of activities and needs. The group meets the first Friday of every month, except during the summer. Annual Auxiliary fundraising activities include: Spring Showers, the Strawberry Festival and the Harvest Luncheon. For more information about volunteering, or joining the Auxiliary, please contact the Home’s Activities Director at 718-548-5100, extension 225.